The Liberty Bell has become a symbol of freedom around the world. Its inscription, from the Old Testament book of Leviticus 25:10, declares, "Proclaim Liberty throughout All the land unto All the Inhabitants Thereof." 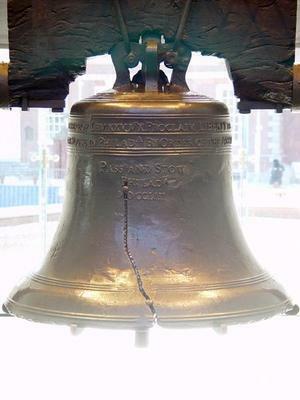 The bell was not originally called the "Liberty Bell" -- a name that attached to it in the nineteenth century -- and was hardly distinguishable from many other colonial-era bells. In 1753 it was hung, following the custom of the day, in the steeple of the Pennsylvania State House. Its ringing would have been heard throughout Philadelphia, then the largest city in British North America, to highlight important news. It tolled, for example, when King George III ascended to the throne and when Benjamin Franklin was dispatched to London to discuss colonial grievances. It also tolled to summon the Pennsylvania Assembly to meet. In the 1760s and '70s, its tolling would have called together delegates to debate the Sugar Act, Stamp Act, and other oppressive measures passed by the British Parliament. Four days after the Declaration of Independence was adopted, the Liberty Bell rang out to summon citizens to hear Colonel John Nixon give the first public reading of the Declaration of Independence (July 8, 1776). The bell cracked sometime between 1817 and 1846; exactly when remains a mystery; some people claim that it split during the death knell for Chief Justice John Marshall, who passed away on July 6, 1835. The National Park Service observes, "The Liberty Bell cracked long ago, but as an icon of freedom its voice has never been stilled.... Its crack is a reminder that liberty is imperfect, hopefully evolving to include those who have been denied full participation in a democratic society."